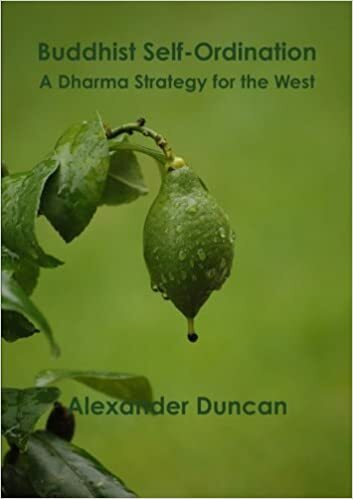 Originally published in 2011, Buddhist Self-Ordination: A Dharma Strategy for the West is the first publication by Alexander Duncan, with which he began his quest for the truth of the Buddhavacana. Although Alex has written more and better books subsequently, notably Fundamental View, Conversations with the Buddha, and Dharma Talks, Buddhist Self-Ordination is valuable for the insight it gives into Alex’s original inspiration and motivations. According to the bio at the end of the book, Alex is an adherent of Tantric mahasiddha, Ngakpa, and Dzogchen traditions. He lives in Deer Park [sic! ], Toronto and practices in the local parks and ravines. The underlying concern of the work is the degeneration of the Dharma Transmission to the West since the Second World War into a sycophantic reverse colonialism of Asian Buddhist teachers, all vying with each other to establish their particular cultural and historical brands in the West, often mixed up with pecuniary motives, with little regard for the Buddhist verities and little respect for their rather naive Western disciples and each other. Alex came to this conclusion reluctantly after joining several Buddhist groups, including Rigpa, the Nalanda College of Buddhist Studies, the Nalandabodhi Foundation, and the Toronto Centre of Gravity Buddhist Association, and several online Buddhist forums including StackExchange, all of which he found wanting. Seeking a solution to the quandary of how to establish Buddhism in the West in an authentic, effective, profound, and creative way, he sought for the answer in the bodhisattva vow, recognized by all schools, including Hinayana and Mahayana, which he took in 2011 and again in 2012, resulting in an outpouring of several hundred thousand words which continues to this day and can be read at www.palisuttas.com and in a related series of books. Alex is also active on Quora and teaches monthly at the Riverview Dharma Centre, Yarmouth sim, Second Life. Most recently he gave a series of four one-hour talks on the Lotus Sutra. Alex refers to himself as an eclectic universalist generalist and finds value and significance in all Buddhist teachings and traditions. He proposes that with the advent of powerful computer search engines and databases and the imminence of artificial intelligence (AI), it will soon be possible to compare, collate, and resynthesize the totality of dharma, including all suttas, sutras, and termas, in all languages, with accurate instantaneous translation, into a truly universal Buddhism that will succeed sectarian Buddhism and establish the ekayana (‘one way’) as the basis for the transition to a global Shambhala society over the next few centuries, culminating in the advent of the true Aquarian Age in the early 25th century, when human society has degenerated into barbarism, followed by a new golden age of Buddhist civilization. This book is a brave and exhilirating adumbration of a glorious future dharma, when science and spirituality will merge in a global spiritual awakening.